Our vacation condo is located in the heart of Summit County minutes from Keystone, Breckenridge, Copper Mountain, Loveland, Arapahoe Basin, and Vail ski areas. The towns of Dillon, Silverthorne, Frisco, and Breckenridge are a short distance away. Dillon Lake is approximately 2 miles away. Cross country skiing, hiking, and biking trails start a few feet from our back door. This is a luxury, 2 bedroom, 2 bath condo sleeping up to 4 people. A queen-size bed is in the master bedroom, twin beds are in the 2nd bedroom, and a queen-size sofa sleeper is in the living room. All 1100 sq. ft. are on the ground level with parking directly outside the front door. The open kitchen, dining area, living room, and patio have a southern exposure with a view of mountains behind the condo. Amenities and Information:: The kitchen is fully equipped with dishes, cookware, small appliances, ice maker, microwave, and dishwasher. Towels and linens are supplied. A Jacuzzi tub is in the master bath. The condo has a full size washer and dryer, gas fireplace, 2 TVs on cable, a DVD/VCR, and gas grill. A high speed wireless internet connection is provide. The free shuttle bus stops at the end of our parking lot. (The shuttle can be taken to towns and ski areas in Summit County.) This is a non-smoking unit and pets are not permitted. Need Help or Advice? : If you've never skied or this is your first visit to Summit County and need information or advice, we'll be glad to offer help or suggestions to renters of our condo on how to make your stay fun and enjoyable. Renters are encouraged to contact us if they have any questions about the area. Our condo is conveniently located a couple of minutes from Silverthorne and Dillon. It backs to the national forest with hiking and cross country ski trails starting at our back door. Our condo is completely furnished with everything needed for a comfortable stay. Open parking close to entrance. New Smart TV on cable with many channels, including HBO, and NetFlix. Kitchen is well stocked with dishes, cooking utensils, glasses, etc. A large hot tub is in the condo complex, and is available for renter use. The hot tub is approximately 80 feet from our front door. The condo was very night and we had a great time! 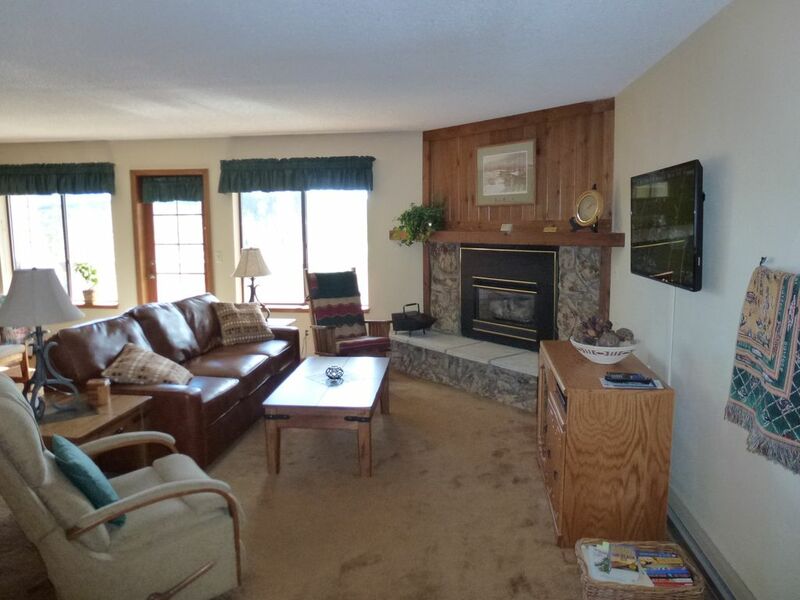 Wonderful condo situated right in Summit County. We were there for a week and skiied Brekenridge, A Basin and Keystone. Under 30 minutes to all three resorts. We really appreciated the well stocked kitchen (spices, condiments, plenty of dinnerware). There was plenty of towels and even detergent for the laundry. This place has every little thing that we needed. The fireplace was great after long ski days and VERY warm. The beds were comfortable even including the pullout couch. The views out the back deck were beautiful. The hot tub was a little disappointing as two of the nights we had cold water and the jets didn't work that great. We had loud neighbors above us (but we understand the owners can't control that). It was a little frustrating to hear the cleaners above us running a vacuum at 630 in the morning. Otherwise a beautiful condo close to town. Nicely plowed parking lot with ample parking. Would definitely stay here again! Thank you! Well equipped kitchen and nice to have Netflix to watch after a day of skiing! We recently stayed in this property for a long weekend ski trip. It exceeded my expectations. It was comfortable and cozy and we had plenty of space for the 4 people that were on the trip. The kitchen was extremely well stocked with some essentials. I've stayed in rentals where you have to buy salt and pepper! We cooked almost all of our meals at home. The location was perfect for many ski resorts in the area as well as local shopping and necessities. We didn't take the bus but there is a stop right at the entrance to the complex. If you are looking for great location and value I highly recommend this place! Clean ,comfortable and very well kept. Very well stocked kitchen. Close to everything we would stay here again. Owners very easy to work with. This was an excellent condo. Clean, comfortable, good proximity to town and the slopes, and a great kitchen well stocked with quality cookware. Summit County Colorado, offers an unlimited variety of both summer and winter recreation. This is one of the premier ski areas in the US. Five major ski slopes are within 15 minutes driving distance. Vail is 30 minutes away. Other Activities: Summer activities include biking, hiking, fishing, sailing, golf, horseback riding, white water rafting, and boating. Dillon Lake, which is a few minutes away, has the highest marina in the US. Sail and power boat rentals are available to explore this 3200 acre lake. Numerous hiking and mountain biking trails of various lengths and difficulties offer back country solitude. The county also has an extensive system of paved walking and biking trails. A beautiful public golf course is located just north of Silverthorne. A number of rivers, including the Blue, Williams Fork, and Colorado, offer great trout fishing. The area has many unique shops, and a large outlet mall is located in Silverthorne. Many excellent restaurants are also available throughout the area. $680-1375/Week The listed rates do not include a 6.375% tax and a $100 security deposit. The security deposit is fully refunded after the condo is checked to verify there is no damage and/or an exceptional amount of cleaning is not required. The rates also do not include the service fee charged by HomeAway/VRBO. Please note minimum stay of 4 nights. Please call us (816-587-9634 home or 816-392-5441 cell) to get information about reduced rates if you are a mature couple (no children) interested in a stay of a month or longer.